It was 1984, and Hiyao Miyazaki had the world at his feet. His directorial debut, the animated feature film Nausicaä of the Valley of the Wind he created with producer Isao Takahata, had been both a critical and commercial success. But it had come at a cost. The industrious and meticulous Miyazaki had by this time spent years on Nausicaä, initially in its manga iteration, and later as the director of its feature-length anime adaptation. Miyazaki’s imagination had been sparked by a childhood visit to Minamata Bay on the west coast of Kyushu, whose waters — heavily-polluted by mercury and other toxins — had caused sickness to a local population reliant on a seafood diet. Miyazaki was fascinated by how nature adapted to — and thrived in — this poisoned environment. Much of this influence can be seen in the flora and fauna of Nausicaä. After box office success, Miyazaki and Takahata began exploring ideas for future collaborations. Miyazaki had by that time the rudiments of an idea that would see Takahata pack a small suitcase and travel to Yanagawa, a city in the south of Japan popular with tourists for its extensive network of canals. Miyazaki, on a previous visit to the city, had considered it suitable inspiration for the setting of an animated film centred upon the area’s schoolchildren. Takahata was dispatched to scout locations. Arriving in Yanagawa, he sought to explore Yanagawa’s waterways by donkobune — the narrow, pole-manoeuvred riverboat ubiquitous to the town. He observed the people of Yanagawa; the women rinsing rice on the banks of the canals, the men working the fields, driving irrigation wheels by hand, and the schoolchildren — trousers rolled hastily above knees — wading with nets in the hope of catching small fish. Most crucial of all though, was Takahata’s meeting with Tsutae Hiromatsu, the head of the local water supply division, who explained the extensive revitalisation of its canal system the city had seen. Takahata was captivated. Upon his return home, Takahata explained to Miyazaki that rather than using Yanagawa as the inspiration for an animated feature, he wanted to film a documentary about the city, its people, and its 290 miles of canals. Miyazaki turned to Suzuki for advice. Suzuki told Miyazaki that with an extra 60 million yen in the bank after the success of Nausicaä, he should lend Takahata half to make his canals documentary. Miyazaki agreed, and gave Takahata a year. That year turned into two as he quickly fell behind schedule, returning again and again to Yanagawa, filming and talking to its residents and exploring its labyrinth of waterways. What had begun as a trip to scout locations had become an obsession. Eventually, with patience and finances running low, an exasperated Miyazaki had had enough and finally cut off funding for the project. Miyazaki turned again to Suzuki for advice, “I don’t want to have to remortgage my house!” Suzuki suggested making another movie to cover the costs of Takahata’s canals documentary, and to save Miyazaki from going broke altogether. It was this conversation that gave birth to Studio Ghibli, with Miyazaki, Takahata and Suzuki as its co-founders. Soon after, Miyazaki had begun work on what would later become the first Studio Ghibli film proper, Castle in the Sky. Meanwhile, Takahata returned home to edit the thousands of hours of footage. The Story of the Yanagawa Canals ( 柳川堀割物語) was finally completed in 1987, after a long three-year production schedule. Suzuki would later recall, “if Takahata had made his movie on schedule, Laputa [Castle in the Sky]wouldn’t have been born.” Perhaps the same could also be said for Studio Ghibli itself. What Takahata had created was an almost three-hour long documentary chronicling the vast and complex network of canals in Yanagawa city and its surrounding region. Exploring the region’s history, the film touches on themes now synonymous with Ghibli — man’s symbiotic relationship with nature, the pitfalls of modernisation, nostalgia. Takahata’s live-action footage is complemented with Miyazaki’s charming animated segments interspersed throughout. Ambitious in its scope, the film looks at the history of the construction of the canals, its use as an irrigation system, and charts the waterway’s neglect and eventual fall into disarray during Japan’s post-war economic boom. 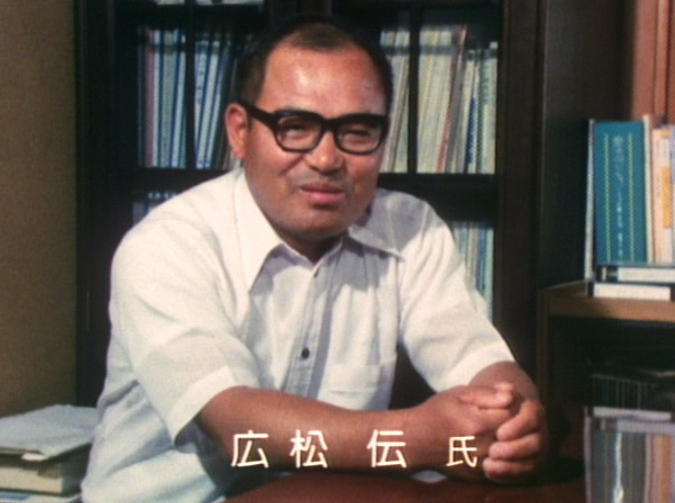 The hero of the piece comes in the form of Tsutae Hiromatsu, the unassuming head of the local water supply division. Assigned with overseeing the removal of Yamagawa’s canals — which were by now foul-smelling and in a state of disrepair — Hiromatsu instead reported to his superiors that the canals should be saved, with the involvement of local residents. Incredibly, Hiromatsu managed to persuade city officials that the project could succeed. With local residents on board, he set to work reclaiming the cities waterways to their former glory through traditional practices. Despite its unwieldy length and at times technical explanations, what Takahata created in The Story of Yanagawa’s Canals is not only an insight into the embryonic world of Ghibli, but in its own right a masterpiece, both startlingly different from later Ghibli films and yet entirely consistent in tone and spirit. The Story of Yanagawa’s Canals originally aired on Japanese public broadcaster NHK and was released domestically shortly thereafter on VHS and LaserDisc. A DVD was released in Japan in 2003. Have you watched The Story of Yanagawa’s Canals? Share your thoughts in the comments below.